Ken Gibson is a founding partner of Cutting Edge Marketing Agents. Ken began his career with The Coca-Cola Company in the Trade Research Department protecting the trademarks of one of the world’s most recognizable brands. 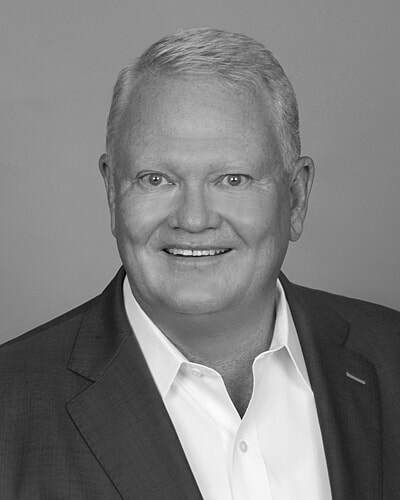 Ken later entered the commercial refrigeration industry as a National Sales Manager for Universal Nolin followed by a progressive sales career with Hussmann Corporation. While at Hussmann, Ken was instrumental in developing and organizing the Convenience and Specialty Stores Group in the Eastern United States. He directed the sales and marketing forces of a 21-state region, selling commercial refrigeration products to the supermarket, food service, convenience store, and specialty foods industries. Ken became a manufacturer’s rep in 1990 when he joined Cutting Edge’s predecessor firm, Wilmar Marketing, as a partner. Today Ken works closely with foodservice consultants and chain accounts as well as managing relationships with the manufacturers represented by Cutting Edge. Ken is a member of MAFSI where he has participated in hundreds of hours of industry training. He is a volunteer with Bridging the Gap Africa and Wreaths Across America as well as a regular platelet donor for The American Red Cross. Ken holds a Bachelor of Science degree in Political Science from Valdosta State University. He lives with his wife, Renita, in Woodstock, GA, and he is the proud Grandfather to twin grandsons and a granddaughter. Barry Pendley is the Territory Manager for the Tennessee and North Alabama markets for Cutting Edge. Barry’s roots in the food service industry date back thirty years and include equipment sales, food service design and consultation, and point of sale systems. Barry joined Cutting Edge in 2000 and became a partner in the company in 2006. Barry’s prior experience working with three large food service equipment dealers gives him a unique perspective into the challenges and opportunities the dealer community encounters. Barry has vast experience working with some of the largest restaurant chain accounts which has taught him how to work with both corporate owners as well as franchisees. Barry is deeply rooted in the Nashville community where he lives with his wife Jalana. He enjoys hiking, kayaking and anything outdoors. Barry has two adult children and one grandson. Ben Decker is the Territory Manager for Metro Atlanta. Ben’s experience in the food service industry began in 2000 where he worked progressively through QSR restaurants before entering the fine dining sector. Prior to joining Cutting Edge in 2012, Ben became a highly requested DJ with a large Atlanta entertainment company where he planned, coordinated and executed large and small events to perfection. Ben also gained valuable sales experience while selling Ford and Lincoln products with a large automotive group. Ben’s multi industry sales experience allows him to bring a broad perspective to working with both foodservice professionals and the dealer community in order to meet their needs from conceptual design to installation. Ben lives on a mini-farm in Canton, GA with his wife Hunter and identical twin sons. Ben is an avid supporter of professional sports in Atlanta; especially the Braves, Falcons and Atlanta United. Renita Gibson is the Controller for Cutting Edge and also handles Project Management responsibilities for key chain accounts. A graduate of Georgia Tech, she possesses 26 years of experience in the financial services industry. Her emphasis on high-level customer service and business strategy comes from a career specializing in Commercial Banking as well as residential real estate finance. Renita uses the presentation and management skills she honed while working as a Corporate Trainer with SunTrust to lead special projects and training events for the company. Renita resides in Woodstock, GA with her husband Ken. She enjoys playing the piano, traveling and watching the sunset from rooftops. As a former bone marrow donor, she is also passionate about her work with Be The Match, National Bone Marrow Registry. Patrick Gillen is the Territory Manager for Alabama and the Florida Panhandle. Patrick joined Cutting Edge in 2016 after a progressive career in the food service industry. Patrick has experience in all facets of the restaurant industry from being a server, bartender and restaurant manager culminating with his position as the Food and Beverage Director for Top Golf in Atlanta. Patrick’s hands on experience uniquely qualifies him for his current position working with the dealer community, restaurant chains and chefs. Patrick’s experience as a college, scholarship athlete instilled a tremendous work ethic that his customers reap the benefits of today. Patrick and his wife Nikki live in Canton, GA with their three beautiful daughters. Patrick is a soccer enthusiast and continues to play on a competitive level. Davy Phillips is a Territory Manager and Installation Manager for Cutting Edge. Growing up with a dad who is a CIA trained chef, David was introduced to great food and the foodservice industry at a very young age. David’s passion for the industry has lead him to not only hone his sales skills but also become proficient in equipment installation. His prior experience as the Equipment Installation Manager for TriMark Century Concepts & ESG provides David with a knowledge of the dealer community and has afforded him the opportunity to physically work in many restaurants and institutional foodservice provider locations. His installation capabilities and project management skills have enhanced Cutting Edge’s ability to bring full service solutions to their customer base. David holds a Bachelor of Science degree in Accounting from Niagara University. Kristi Smith is the Inside Sales Coordinator and Office Manager for Cutting Edge. Kristi holds a Bachelor of Arts degree in Psychology from Furman University. Prior to joining Cutting Edge, Kristi worked in the mortgage banking industry as a Loan Processor. Kristi’s twenty plus years of working in increasingly complex administrative positions have honed her attention to detail and project management experience. She puts these skills to work on a daily basis managing installations for large chain accounts as well as quoting bid jobs for the company. Kristi and her husband Donald live in Canton, GA with their daughter and three dogs. Their older son is a collegiate basketball player.